Getting to Chiang Mai from the Surin Project is a 14 hour journey. All of the mahouts gather to send of the volunteers. A flurry of “lob pop gon mai” (hope to see you again) and wais (bowing), with a few hugs thrown in much to the chagrin of the Thai, followed by a group photo and we were off. The first hour of the trip is the truck ride from Ban Tha Klan to the bus station in Buriram. Watching the green countryside roll by in the setting sun, we said good bye. Buses in Thailand are actually pretty comfortable, especially the VIP Gold Class buses. The seats recline and have leg and feet rests. Snacks of crisps (potato chips), water, soy milk and a sandwich are provided throughout the course of the trip and the bus stops for food about 2 hours into the trip. The only uncomfortable part of this particular trip was the temperature. It was cold. Very, very cold. Once again I was grateful for the $5 wool blanket I had purchased in Nepal. For the first 1.5 hours, I tried to type on my computer. Finally, I gave into the cold and tiredness. Huddled under the blanket provided by the bus with my other blanket pulled over my head, I slept for most of the remainder of the trip. Every year at Christmas, the Elephant Nature Park holds a Christmas show. At the show, all the various groups at the park do a performance. The mahouts, students from the village, massage therapists, gardeners, staff and volunteers all contribute to the show. Under the auspices of Christmas, everyone also receives a gift in appreciation for their work throughout the year. Santa (and Santee, the female Santa Claus) make an appearance to help Lek, the founder, distribute the gifts. When Chet asked me if I wanted to go with Miss Patty to help set up for the Christmas Show at the park, I jumped at the chance. Christmas day morning, we loaded our sleigh (actually 2 vans) with the gifts, some desserts and a bottle of SamSong “rum” and headed off to the park. Decorating for the show started in earnest after we had a chance to eat lunch. Balloons were inflated and banners hung with care. The tree was decorated with lights and tinsel, and boxes wrapped in paper and bows placed underneath. The stage was set and lights were strung from the ceiling. In short order, the feeding platform of the park was transformed into a wonderland of colors and was ready for the show. 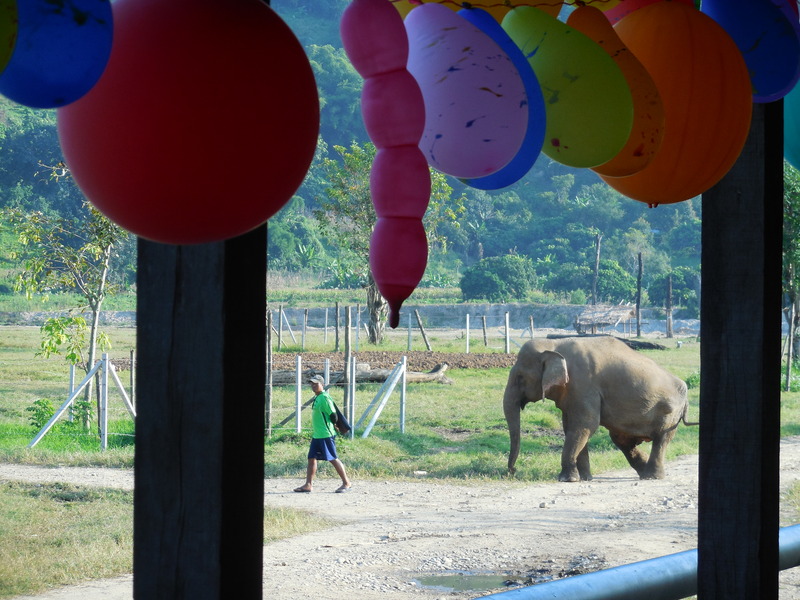 Party balloons with Mae Do heading for her shelter for the evening. The local village children started the show with their traditional hill tribe and Thai dances, looking so adorable in their traditional dress. Rocky did a magic show. The massage ladies did a traditional Thai dance. The mahouts played Christmas songs with a Thai feel on their flutes made out of PVC and drum made out of a bucket. And for the fourth year in a row, Chet did his fabulous job as emcee. The best part of being at the park for the Christmas show was the chance to catch up with friends that I haven’t seen in several months. Just like a family gathering, everyone was there. Hugs, smiles, laughter and talk filled the evening. Just the way Christmas should be. Chet and my annual Christmas pic. Much of my last week in Chiang Mai was spent seeing what it would be like to just exist without filling my days with motorbike rides and tourist activities. 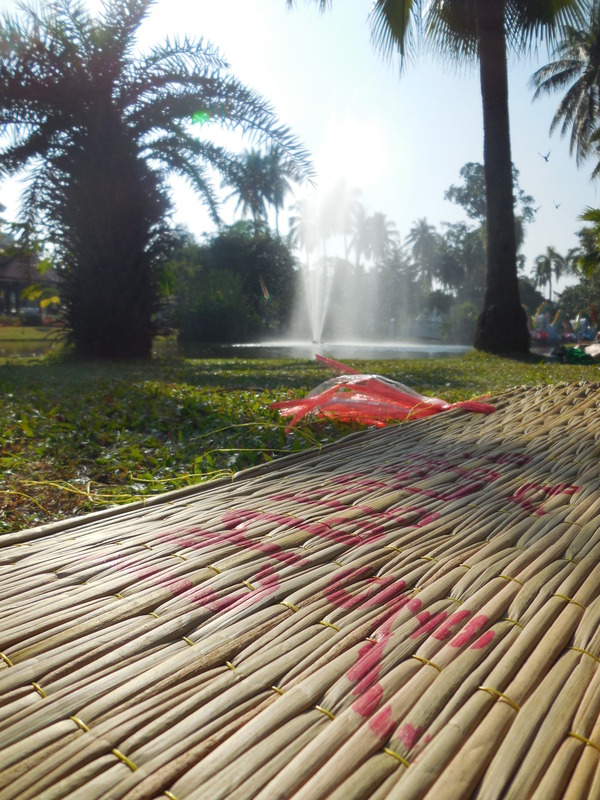 Not wanting to be confined to my guest house and longing to be in the sunshine, I headed for Nong Buak Hard Public Park. A little oasis of green nestled into the southwest corner of the old town. The park boasts a small lake with bridges crossing over it and a fountain, playground area for children (which I believe is where all of the metal playground equipment we grew up with went when it was determined it was too unsafe), and a bevy of vendors selling fish food, bird food, people food and renting mats to sit on. Inside the park, the sounds of the city fade away, replaced by the cooing of the pigeons. Stopping to rent a mat (10 bhat ($0.30) for as long as you want to use it) I headed for the south side of the lake, out of the spray of the fountain, away from the other farang (foreigners) in their bikini tops, and in the sun. My mat in the sun in the park. Mostly I spent my time writing in my journal, reading a book and thinking about some of the massage workshops I want to develop in 2014. I also was on a mission to start making the coin flowers for my friend Chet’s monk ceremony that will be coming up in June 2014. During the monk ceremony, hundreds of coin flowers are blessed and then thrown out to the people in attendance. Catching one is believed to be good luck (and like kids racing for candy from a piñata, a chance to tear the ribbon flowers apart for the coins at the center.) 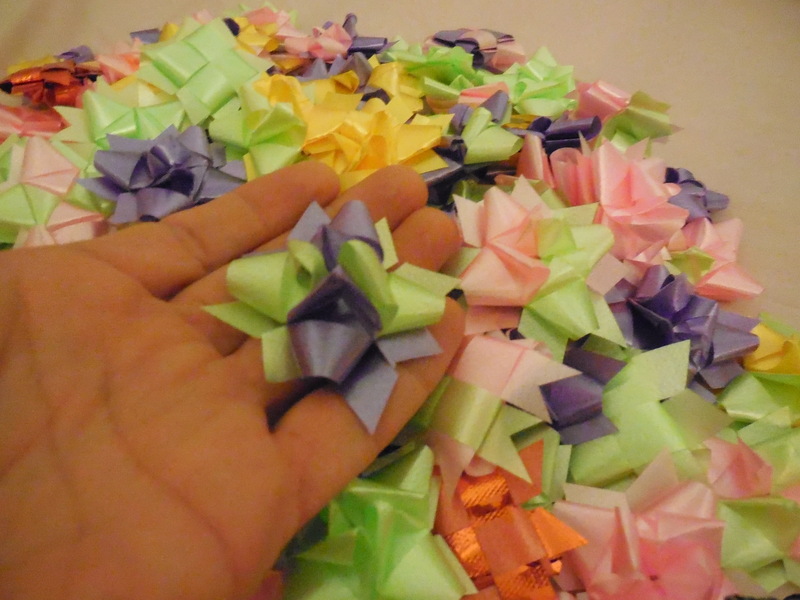 And the majority of three out of my last four trips to Thailand have been spent making these flowers. One of the days that I was sitting in the sun making the coin flowers, two Thai girls set up their mat close to me. After a while of watching me, one of the girls came over and asked me (in Thai) what I was doing and wanted me to show her how I was making them. She spoke almost no English, so using mostly gestures and having her follow along, I taught her how to make the most simple of the flowers. When we finished one, she wanted to make more so that she would remember how to make them. Eventually her friend, who spoke more English, pulled their mat over to join mine and we spent the next hour and a half making coin flowers and talking. With their help that afternoon, I was able to accomplish my goal of 100 coin flowers for the week. My first 100 coin flowers for Chet’s ceremony.